Your new favourite weeknight dinner. Salty unami marinated aubergines, fragrant nutty wild rice & pomegranate seeds for a pop of tart sweetness. Vegan, GF & healthy. Cut the aubergines lengthways into two halves. Cut a crisscross pattern into the flesh of each half, being careful to not pierce the skin. Lie the aubergine onto a baking tray cut side up. In a small bowl, mix together the miso paste, honey/maple syrup, olive oil and tamari/soy sauce until smooth. Evenly spoon the marinade over the aubergine halves using the spoon to push the mixture down into the cuts. Place the tray into the fridge for 1-2 hours to allow the aubergine to absorb the flavour*. Preheat the oven to 180°c fan/200°c/360°f. Remove the tray from the fridge and place into the oven for for 45-50 minutes or until the aubergines are soft in the centre and the marinade has caramelised on the top. 25 minutes before your aubergines are due to come out of the oven add your rice to a pan of boiling salted water and simmer for 18-25 minutes until just tender. Drain and return to the pan. Add the herbs and pepper to the cooked rice and stir to combine. To serve, divide the herbed rice between two plates. Add the aubergine halves to the top and sprinkle with the sesame seeds, pomegranate seeds and a few extra herbs. Serve whilst still piping hot. *I have found that 1-2 hours is the best marinading time for these miso aubergines. You can also leave the aubergines marinating overnight, or if you have no marinading time at all you can just cook them straight away - they will still be delicious. 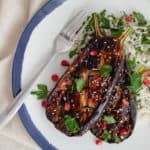 The miso marinated aubergines are best eaten straight away but any left over herby rice can be kept in an airtight container in the fridge for up to 3 days. It is perfect with salads. This recipe can be easily doubled or tripled if you are feeding a crowd! Gluten Free: Assure that your miso paste is certified gluten free and use tamari rather than soy sauce. I have used brown rice miso for this recipe but any type of dark coloured miso will work equally as well. I have used a pre-mixed pack of basmati & wild rice here. If you can't get your hands on it you could also simply use basmati or brown rice too.